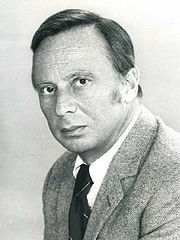 Norman Fell (Norman Noah Feld; March 24, 1924 – December 14, 1998) was an American actor of movie and television. He is famous for his role as landlord Mr. Roper on the sitcom Three's Company and its spin-off, The Ropers. He won a Golden Globe Award. Fell was born on March 24, 1924 in Philadelphia, Pennsylvania to a Jewish family. He studied at Central High School of Philadelphia and at Temple University. He also studied at The Actors Studio. Fell was married was married to Diane Weiss from 1961 until they divorced in 1973. Then he was married to Karen Weingard from 1975 until her death in 1995. Fell died on December 14, 1998 from cancer in Los Angeles, California, aged 74. This page was last changed on 28 January 2016, at 05:42.